New OSHA hazard communication standards – revised for streamlined compliance. OSHA has strategically revised their hazard communication standards to correlate with the Globally Harmonized System (GHS). OSHA’s new hazard communication standards go into effect December 31, 2013, requiring workers and officials to be trained on these standards. The new hazard communication standards (HCS) is OSHA’s method of committing to employees safety. The revised standards are made to ensure the safety of individuals who manufacture, import, handle, store or come in contact with hazardous chemicals. Employees must be properly trained on how to handle and store hazardous chemicals. Workplaces must clearly display safety data sheets (SDS) to inform bystanders or customers of potential dangerous with each chemical being stored. The Globally Harmonized System (GHS) is a standardized system, used internationally, for classifying hazardous substances. This system has been analyzed by chemical industry experts across the globe, including OSHA officials. What is new about the OSHA hazard communication standards? Formatting, regarding labels and safety data sheets are now required to be standardized. Standardized information includes hazard classification, hazard labels, and safety data sheets. 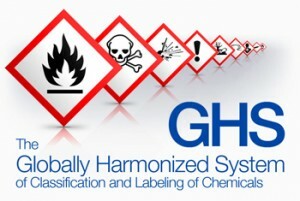 Employees and officials must be trained, on the new GHS label and safety data sheet formats, no later than December 1, 2013. Compliance with employers and distributors, regarding the GHS standards, is not fully required until June 1, 2015 and it does not become effective until December 1, 2015. With the new OSHA hazard communication standards in place, OSHA is shifting the perception of “knowing” to “understanding” possible hazards associated with chemicals. New OSHA hazard communication standards are meant to provide a streamlined knowledge of chemicals, their classifications, and most importantly their hazards.